Outside of burgers, I also love bicycling. It’s a great way to see the world and a great form of exercise, especially when you eat as many burgers as I do! I often ride my bike through Harlem as the streets are less busy, especially in the morning and its an area of NYC rich with interesting history and location. 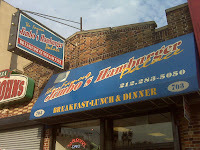 On many a bike ride, I have noticed several locations of a chain, exclusive to Harlem, called “Jimbo’s Burger Palace.” After a serious amount of Google searches and questioning our friends at A Hamburger Today, Burger of the Month Club, Hamburger America, the Feed Bag and more, we came up with no info. So while crossing the 145th Street bridge on a 17 mile bike ride this morning, I saw the 703 Lennox Ave location and decided to investigate. 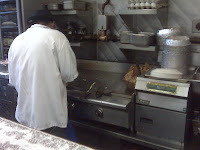 Jimbo’s for all intense purposes is a short order grill / greasy spoon serving up advanced bodega food. A few tables, a very popular counter and a flat top grill make up the joint. Removing my helmet, I looked up at the menu and the words “Egg Cheese Burger” confirmed I had made the right choice. 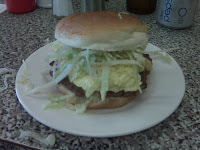 The chef whipped out a fresh 7oz patty and began to fry it along with some onions and an egg. A few moments later he handed me this little beauty with a melted slice of American cheese and shredded lettuce. Expecting nothing more than a greasy counter burger, I was surprised to bite into what turned out to be a tasty breakfast and not nearly as greasy as I expected. 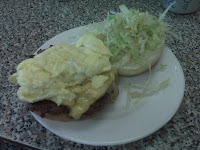 The fried egg and onions definitely made the difference on this classic style thin patty cheese burger. 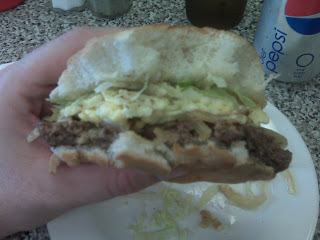 This entry was posted in Burgers, Hamburgers, Harlem, New York and tagged best burger, breakfast, burger conquest, cheese, ciancio, david, french fries, hamburger, harlem, jimbo's burger palace, nyc, restaurant, rev, rev rides, review. Bookmark the permalink. 2 Responses to Jimbo’s Burger Palace – Harlem Burger Mystery Solved! Unfortunately all I had on me was my blackberry so the photos are not perfect but it is what it is. You are just going to have to trust my taste buds.